6002 32xbDZ 5 Pfg. 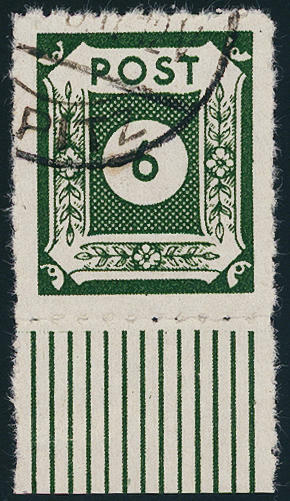 Departure, the good colour middle green, from of the right lower corner of the sheet with printers mark, in perfect condition mint never hinged condition. Rare. Expertized. Kramp BPP. 6003 33yd 6 Pfg. 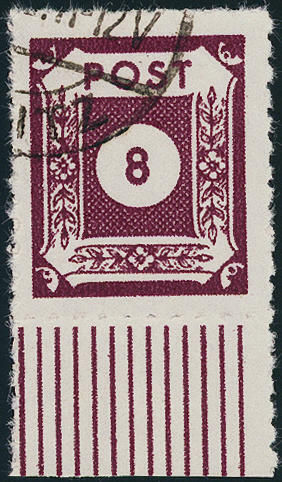 Dark red violet, block of four with strong horizontal defective or badly placed perforation, vertical unperforated, in perfect condition mint never hinged, attractive unit! Photo expertize \"genuine and immaculate\" Kramp BPP. 6004 36P 12 Pfg. Red, unperforated proof on ungummed cardboard paper, fresh colors and with wide margins in perfect condition, very rare, photo expertize \"genuine and immaculate\" Kramp BPP. 6005 36xcDZ 12 Pfg. 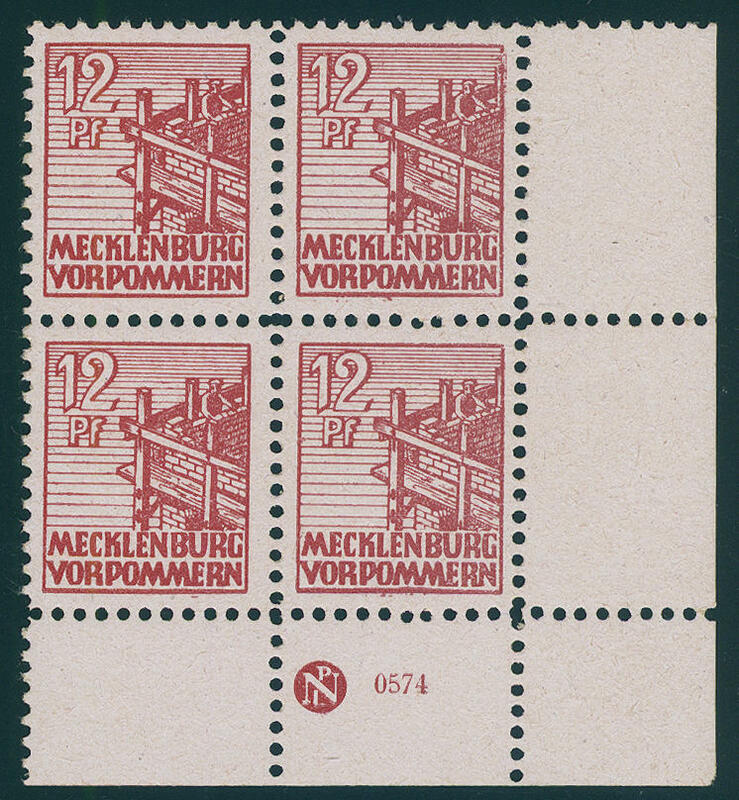 Bright brown red, paper x, block of four from of the right lower corner of the sheet with printers mark, fresh colors and in perfect condition mint never hinged. Rare. Expertized. Thom BPP. Michel 1250,- €. 6006 36zbL 12 Pfg. 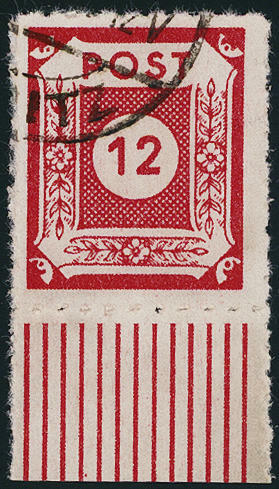 Red, paper z, vertical pair from the left upper corner, with two attached blank fields, fresh colors and in perfect condition mint never hinged. An extremely rare unit. Expertized. Kramp BPP. Michel unpriced. 6007 36zbU 12 Pfg. 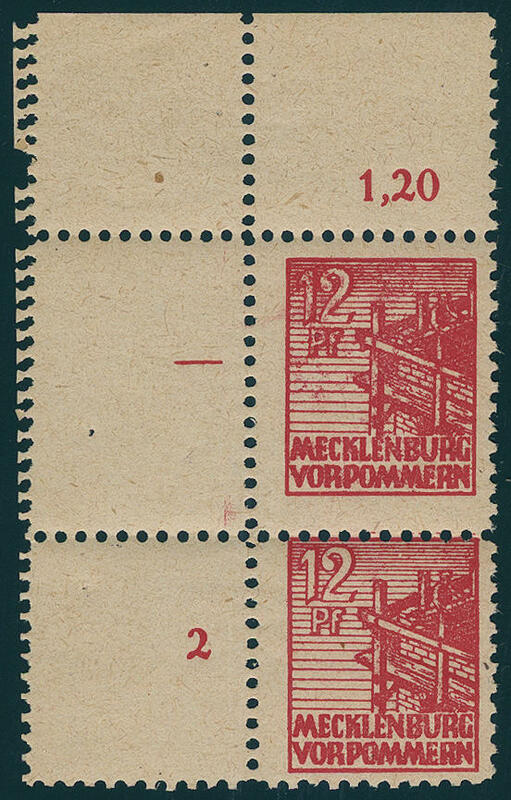 Red, paper z, horizontal unperforated pair, as well the right stamp through sheet fold partial unprinted, fresh colors and in perfect condition mint never hinged. 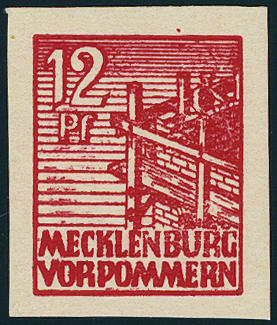 A spectacular variety particularly since in this unperforated form. Photo expertise Kramp BPP. Michel 900,-. 6008 36zfDZ 12 Pfg. 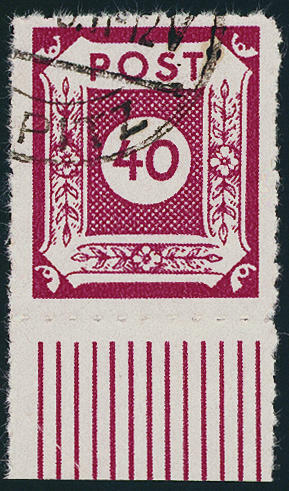 Dark rose, paper z, with printers mark, block of four from the left lower corner of the sheet, fresh colors and in perfect condition mint never hinged. A scarce unit. Expertized. Kramp BPP. Michel 1360,- €. 6009 ⊙ 37yd 15 Pfg. 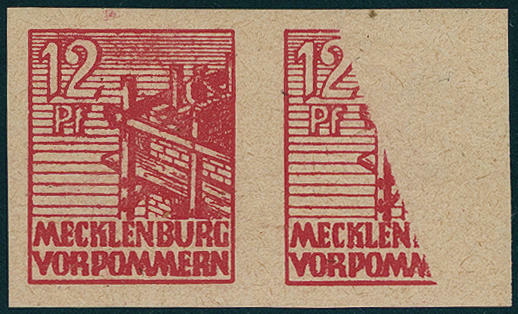 Medium sienna, fresh colors and very well perforated, especially nice centric and neat cancelled \"seaside resort ROSTOCK 8.3.46. \", for the highest standards, expertized Thom BPP with certificate (copy). Michel 300,- €. 6010 38yc 20 Pfg. 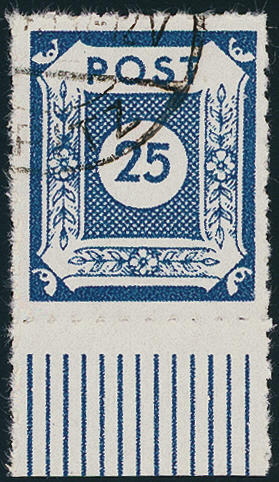 Farewell issue 1946, horizontal strip of three from left margin of sheet, as well the two of them left stamps in rare colour \"blackish gray ultramarine\", as well the right stamp in the colour \"blue\", in perfect condition mint never hinged a particularly beautiful and extremely scarce unit! Photo expertize \"genuine and immaculate\" Thom BPP. 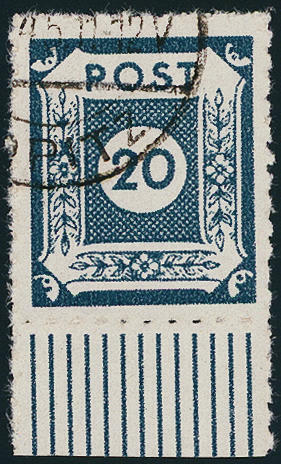 6012 39zbU 30 Pfg. 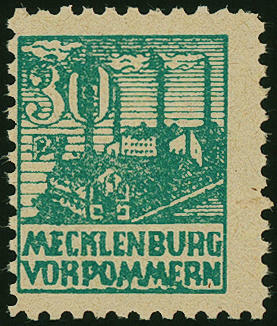 Dark opal green, large margins all around unperforated, fresh colors and in perfect condition mint never hinged. An extremely rare variety of the only a few few examples are known. Expertized. Kramp BPP. Michel 2500,-. 6013 ⊙ 40yb 40 Pfg. 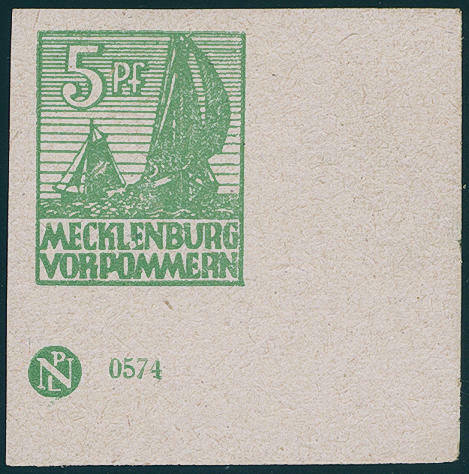 Violet purple, fresh colors and very well perforated, especially nice centric and neat cancelled \"seaside resort ROSTOCK 8.3.46. \", expertized Thom BPP with certificate (copy). Michel 360,- €. 6014 ✉ AP781I 1 Pfg. 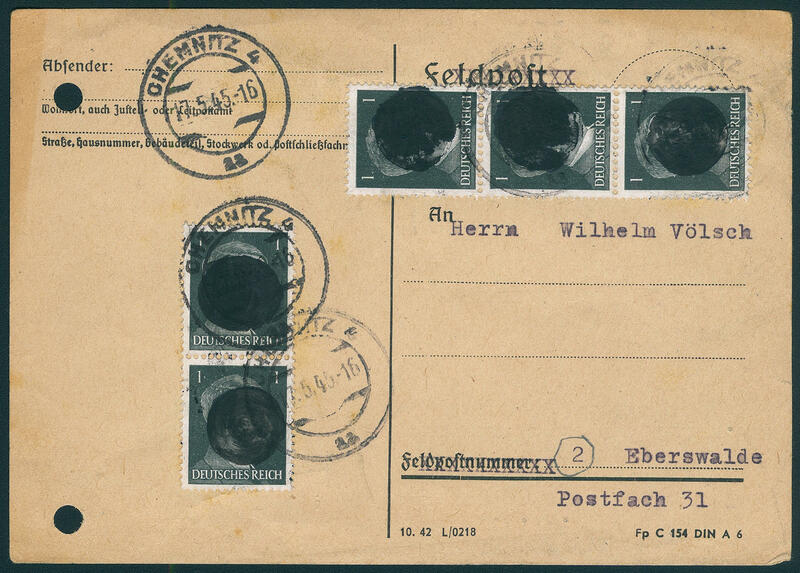 Hitler, vertical pair and strip of three as scarce correctly franked multiple franking on commercially related postcard from \"CHEMNITZ 17.5.45. 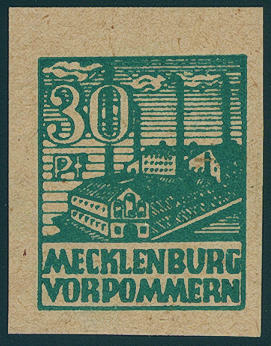 \", left document punching, to Eberswalde. 6015 ⊙ 42/50H 5-40 Pfg., the complete set from nine values with linear roulette 10 from post office Pirna. As well the 20 Pfg. In of the rare colour blackish blue gray. 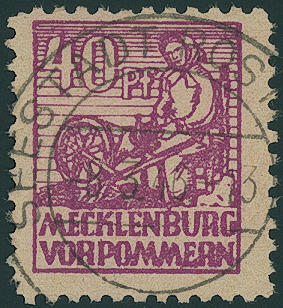 All values fresh colors with faultless roulette, uniform from lower margin, neat cancelled \"PIRNA-COPITZ\". 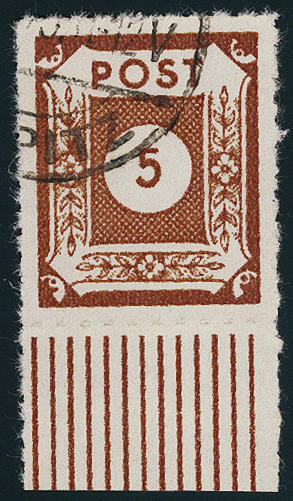 An extraordinarily scarce set, which in the most collections is absent! Photo expertize \"genuine and immaculate\" Ströh BPP. Michel 3400,- €. 6016 ✉ 42A 5 Pfg. 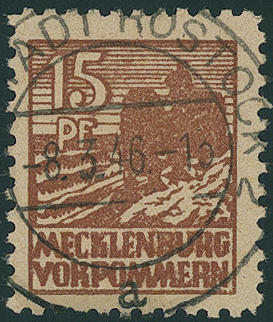 Orange brown, fresh colors and in perfect condition as correctly franked single franking on \"request to the examination one mailing address\" from \"DRESDEN 24.8.45. \" with the corresponding note in outstanding quality. 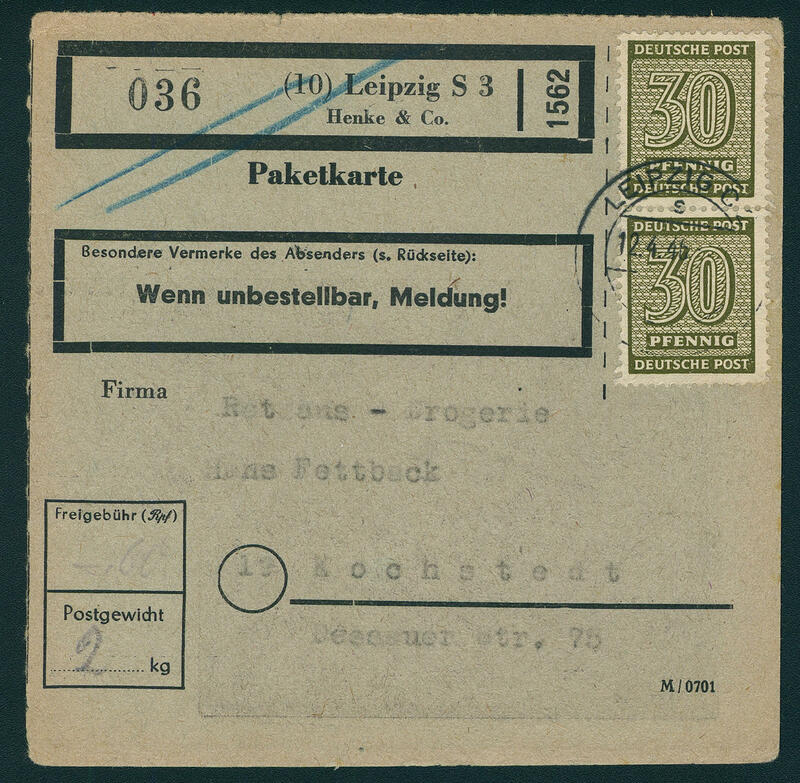 There are only few postcards with this form of usage from Saxony have become known. A Soviet Zone rarity! Photo expertize \"genuine and immaculate\" Ströh BPP. 6017 ✉ 42A 5 Pfg. 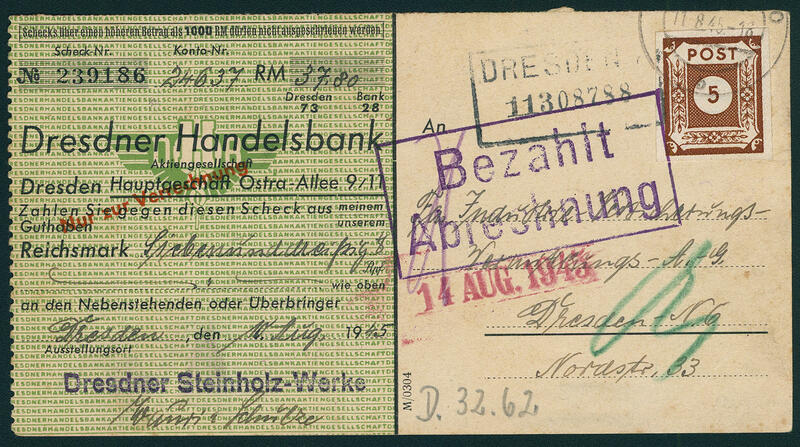 Orange brown, fresh colors and in perfect condition as correctly franked single franking on bank check the Dresdner commercial bank from \"DRESDEN 11.8.45. \" in the local usage transported. 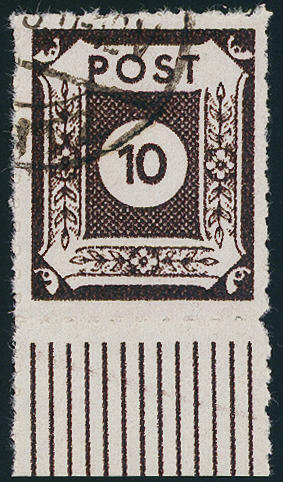 From of the postal service transported bank check cards of this kind are very rare. Photo expertize \"genuine and immaculate\" Ströh BPP. 6018 ∆ 42FUMs,42F 5 Pfg. 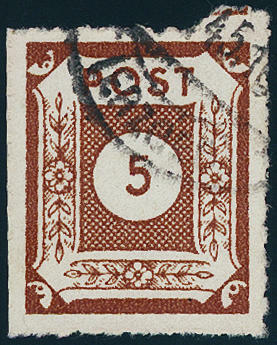 Orange brown, in the horizontal strip of three from the margin, as well the right pair in the middle vertical unperforated, with lines perforation 11 from post office Klotzsche, wonderful fresh colors, very well perforated and in perfect condition neat cancelled \"KLOTZSCHE 6.9.45\" on perfect letter piece. 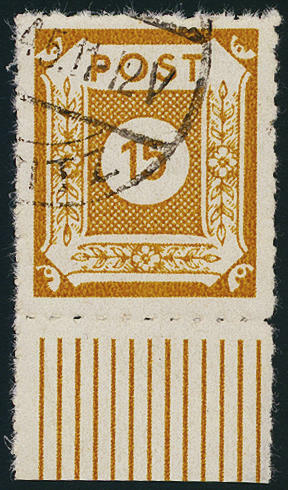 Cancelled perforation varieties this postmaster separation to class among the large SBZ-rarities! Photo expertize \"genuine and immaculate\" Ströh BPP. Michel 880,- €. 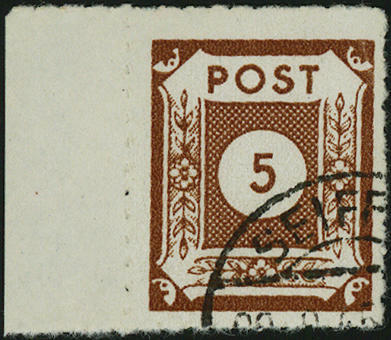 6019 42GUw 5 Pfg. 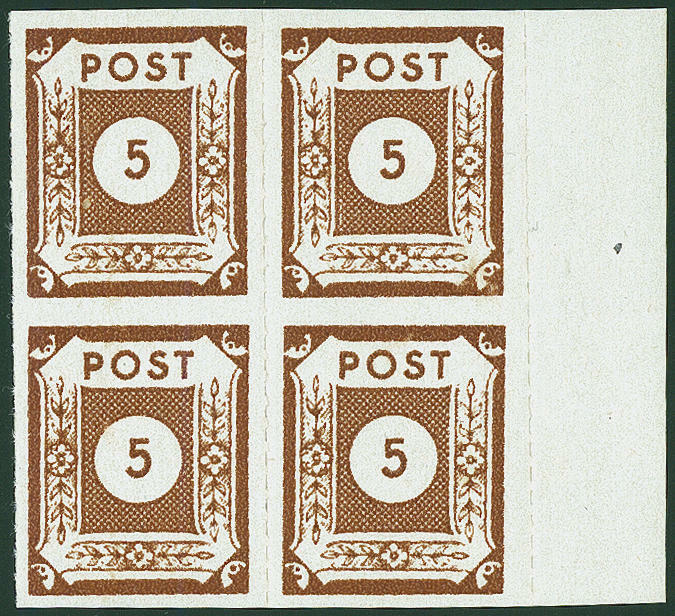 Orange brown with linear roulette and 9 1 / 2-11 from post office Loschwitz, block of four from right margin of sheet, horizontal unperforated, in perfect condition mint never hinged a rarity for the sophisticated special collection! Photo expertize \"genuine and immaculate\" Ströh BPP. Michel 3200,- €. 6020 ⊙ 42L 5 Pfg. 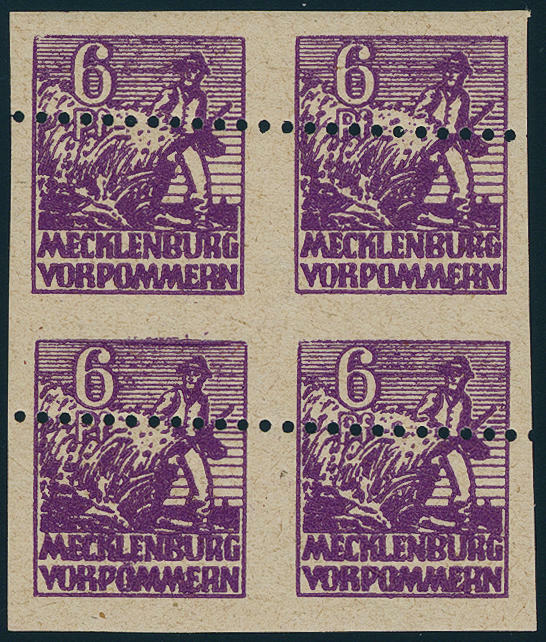 Orange brown with linear roulette 9 3 / 4-10 from post office Seiffen, left margin copy, fresh colors and in perfect condition, neat cancelled \"SEIFFEN 29.9.45. \", photo expertize \"genuine and immaculate\" Ströh BPP. Michel 1,100.- €. 6021 ⊙ 42L 5 Pfg. 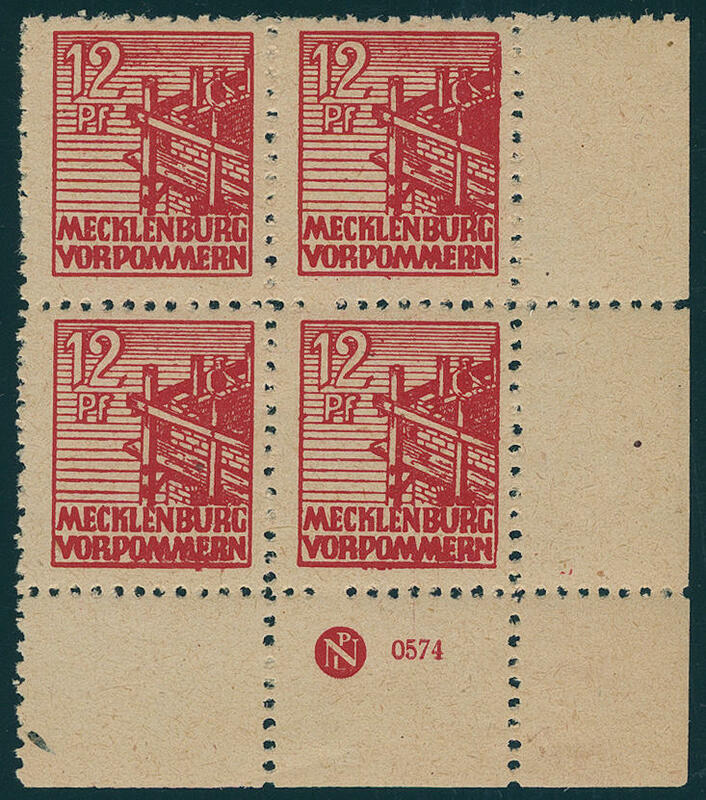 Orange brown with linear roulette 9 3 / 4-10 from post office Seiffen, fresh colors and neat cancelled, photo expertize \"genuine and immaculate\" Ströh BPP. Michel 1100,- €.